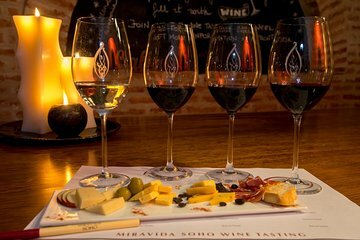 Make your way to Miravida wine cellar, located in trendy Palermo Soho. Meet your sommelier guide and fellow wine-loving travelers before getting down to sipping the local wines. Each tasting session is limited to just 8 people to ensure an intimate experience and personalized attention from your guide. Taste local boutique wines, including representative examples of the varietals that Argentina is known for: Malbec and Torrontes. Pair your wine tasting with appetizers and small bites. You'll have the opportunity to take notes and ask questions. Our sommelier was really incredible. He was knowledgeable and personable, and made the evening into more than just a wine tasting. It was really fun! We learned interesting things about wine in general, as well as so much about the Argentina wine industry. The wines he chose were delicious and not just different brands of Malbec! We learned about other varietals and blends, choosing wine for different meals and occasions, etc. For someone like me who didn't know a lot before and just wanted to have a taste of something Argentina is famous for, I got so much more. The tasting also provided meat and cheese to go with the tasting I don't eat red meat so they brought me more cheese instead which was appreciated - maybe call ahead if you have dietary restrictions, and also delicious empanadas to have afterward again, they made a spinach and cheese one for me after they learned I don't eat beef. The only thing I didn't like is that the hotel door seemed to be locked until right at 6, and I wasn't entirely comfortable waiting in the square outside the hotel after arriving too early. I'm sure the neighborhood was fine, but not being in the know and not speaking the local language if I did need help made me feel vulnerable. Once inside, however, the staff and everything was great. Our group was very small - just 3 of us, so very cozy and friendly. I would do this again. Knowledgeable staff and good way to spend an hour or two for the price. The wine tasting was very nice. We tasted a lot of really good wines, met a lot of nice people and had very good explanations from our guide who knowed a lot of interesting things. The venue was also a really nice place i would advise to try in Buenos Aires. This was one of the best tastings I did in Buenos Aires. The sommelier was fantastic and I met a lot of great people. Definitely a 'Must Do'!!! perspective on politics. The wines were excellent and the sommelier was excellent. This was one of the finest experiences I have participated in. The venue was lovely, the leader waa professional. The wines were delicious. The exterior of the building is very subtle, so if you're traveling there for the first time, do not be alarmed. The neighborhood does not reflect on the establishment in any way! The interior decor is so cute, it kind of makes you want to move in. We booked our wine tasting very last minute, yet they were incredibly accommodating and understanding. The sommelier was very knowledgable and understandable in both English and Spanish. The wine was delicious and poured with a perfect quantity. Throughout the tasting, we were given background information on each wine and how they were made to hear this as beginners was wonderful and interesting! The night finished off with a full glass of our choice of wine and the best empanada either of us have ever had. It was nice to learn about the different wine regions and to taste different wines. Now we know there is more than just Malbec from Argentina. The setting is in a nice little boutique hotel, very nice! This was a great experience! Our sommelier was friendly, wonderful, knowledgeable, and took the time to answer all of our very many questions. The wine cellar in the boutique hotel location was beautiful, and provided an awesome backdrop for us to learn more about the many different wines and wine regions Argentina has to offer. The tour also included cheese and a meat pairing, as well as an empanada to cap it off. I highly recommend this tour! My friend and I had a fabulous time and really enjoyed the high quality wines and intimate atmosphere! I would repeat this experience in a heartbeat if I could!